We recently had the chance to catch up with Iwastology, a motivated team of three young men working to teach the world about recycling and re-shaping the notions of waste. Headquartered in the Philippines, their project takes a grassroots approach, challenging high school students to question waste and consumption patterns by employing media and other forms of communication. 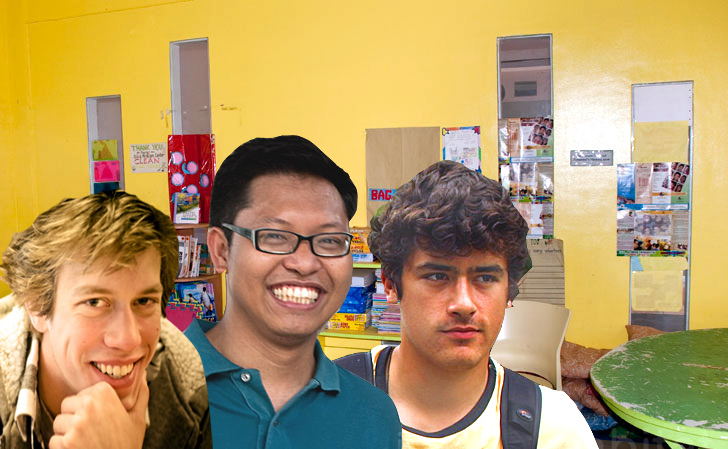 Read on for our interview with Alex Pritz, Arcie Mallari and Christian Elliot, the founders of Iwastology, and see how these youngsters are changing the way their peers think about waste. Thanks to Iwastology, Filipino and Canadian high school students receive media training sessions that empower them to share ideas in highly visual and engaging manners. Spanning oceans and two distinct cultures, the exchanges have resulted in a shift in understandings of trash, waste and consumption. The student-run teams have organized monthly Skype video conferences to develop solutions that involve composting, recycling and other innovative reuse strategies that they will implement in their local communities. Alex Pritz, Christian Elliot and Arcie Mallari discuss their cross-cultural waste management curriculum and their hopes to eventually implement it on a global scale. INHABITAT: Where does the term “Iwastology” come from and how did you come up with the concept for the project? Alex: In Tagalog, the native language of the Philippines, Iwasto means “to fix” or “to make right” and wastology is defined as the study of waste. Together, the two terms come to describe a program that studies how to fix our waste crisis. Much like the name of the project, the concept came from a merging of ideas from the Philippines and North America. Last year Arcie Mallari was studying at McGill University as a Sauve Scholar, searching for ways to create a more dynamic and engaging way to teach marginalized students in the Philippines. Essentially, he was searching for a way to teach children about the world – society, politics, geology, really everything – through the study of what came out the other end –viz. what we throw away. I then brought the idea of film and multimedia into the equation, and together we came up with what it is today a cross-cultural waste management curriculum based on multimedia and the exploration of community practices. INHABITAT: Could you briefly explain the project? How many students are involved? How has the project evolved? How did you guys meet each other? Alex: There are currently 25 students in the Philippines and about 25 students here in Montreal, at St. George’s School of Montreal. Arcie and I met through a mutual friend, and as the idea grew we brought Christian onto the team as well. The idea really sprouted through a series of coffee-break conversations in which Arcie and I would describe the differences between waste management practices in two native countries. As the discussion evolved, we eventually ended up talking about how the technology from North America (vermicomposting, innovative recycling techniques) could help Filipino institutions. We also thought it was important to raise awareness of what waste looks like on a global scale. For example, some mountains of trash in the Philippines are so large that they have caused deadly avalanches onto nearby communities. We wanted a way to take the excitement the two of us felt when sharing these perspectives and translate it into a curriculum we could use to educate high school students about the importance of waste management. That’s when we found St. George’s School and devised the once-a-month live Skype chat sessions in which students swap videos they’ve created about waste in their community and discuss strategies and techniques to combat this over-consumption. Some of the more remarkable ideas that have emerged from this collaborative sharing of experiences are waste segregation and compost facilities that will provide fertilizer to a community garden, supplying vegetables to a local school in the Philippines, an awareness campaign about the dangers of over-consumption, value-added recycling programs which will take bottle caps and other discarded materials and turn them into marketable products, and a water filtration project to reduce waste water. The ideas are currently in the design stage and will eventually be implemented. INHABITAT: What are your goals for this project? How do you see the process affecting the lives of your students? Alex: The most exciting part of this project is seeing that electrified look in a student’s face as they realize what it must be like to live in the other person’s shoes. Students are engaged and excited about learning in a way that I’m not sure they previously were, and that’s owed almost entirely to the fact that this curriculum is real, it is hands on, and it is affecting the lives of other people that they have developed a relationship with, no matter where they are located geographically. In terms of goals, I’d like to see this spread to other schools. We aim to have Iwastology be a completely self-sufficient curriculum model, using local university students to teach the high school students, and using locally sourced volunteer labor for the student-led projects. We’d like to see a high degree of community involvement. The schools and educational programs we operate through in the Philippines are led entirely through a team of dedicated volunteers, and we’d like to have the projects and tangible outputs that emerge from this program directly benefit those that have made this possible. As cliché as it is, it takes a community to raise a child and we’d like to have these children give something back to the community (and natural environment) that has done so much for them. INHABITAT: What are the main differences students have observed between concepts of (and actual) waste in Canada and the Philippines? Alex: The biggest difference by far has been the idea that waste disappears once it reaches the trash can. A lot of the students we’re working with in the Philippines come from families that have worked as trash scavengers at a local dump site and for them garbage is not only a part of everyday life, it can be a means to a paycheck. For the students in Montreal, who come from a well-off part of town in a cosmopolitan city, garbage amounts to whatever disposable items they come in contact with during their daily lives. It really only becomes “garbage” if it doesn’t reach the trashcan, otherwise it is simply out of sight out of mind. At the same time that students at St. George’s were, for the most part, unaware of the realities of garbage on a mass scale, the students at Silid Aralan were completely unaccustomed to ideas of composting or waste segregation that seemed commonplace to their Montreal counterparts. It has been a learning experience on both sides, and as I expected the dialogue has been an equally mutual exchange. 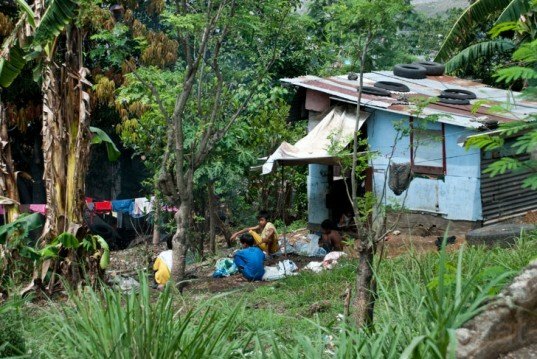 For every preconceived Filipino notion of waste in North America, there are an equal number of Montreal students unaware of just how deadly waste can be in other parts of the world. INHABITAT: How important is media training in the success of your project and do you hope to expand your model to other scenarios? Christian: Media training is vital. Environmental change on a grassroots scale is fundamentally focused on changing the perceptions that informs interactions with our environment, through awareness and education. With media training, we learn to deconstruct the status quo narratives of what we see on the day to day, analyze the individual elements, and re-construct new salient meanings and connections that can lead us to better understand the sources of exploitation or degradation, and perhaps suggest solutions for change. For example, in the Filipino community in which we were living, the state of a polluted river that garbage is thrown into on a daily basis, or the sight of overflowing sewage from a trash dump, over time becomes a normalized phenomenon. Media is quintessential for breaking down the underlining process and succinctly understanding it’s parts, which comes with the territory of working to visually communicate an idea. Here in the west, media aids in breaking the social veil that masks our complacency about personalized decisions involving waste; decisions that aggregates into tons upon tons of garbage buried under the earth each day. The students are asked to portray a message through what they see from the pure visual realities of their environment, and are able to develop organic understandings of environmental realities. Since we are planning on expanding to other schools around the Philippines, we believe the interpretive and analytical powers of media are capable of being applied to a number of other scenarios, flexible to the context-based demands of local environmental problems, whether it’s solid waste management, or something like deforestation and ecological degradation. We’re hoping to recruit film student volunteers from Filipino Universities to help expand the project to other locations, which will likely help in facilitating the communication of the unique environmental perspectives of the students. Media techniques and approaches can be culturally influenced; keeping things organic and being conscious of our western cultural baggage is important too. Christian: I think our greatest contribution will be sharing the value of environmental sustainability through the (media driven) voices of our students, and seeing the resulting changes in the collective discourse due to their developing community projects. We were really lucky to be involved with helping open the veins of environmental thought with our students, and were certainly proud to see them beginning to adopt impact analysis, cradle to cradle thinking, and even some blossoming sensibilities about sustainable enterprise and business. And they’re 14. The great thing is, the community is really supportive of our students, whether parents, teachers, principals, or even local members of government, which means their use of media is capable of making the community listen to ideas of sustainability. They are definitely agents of change towards environmental sensitivity. What we hope to be a lifelong passion for them will certainly be the greatest contribution that we will have made. Last year Arcie Mallari was studying at McGill University as a Sauve Scholar, searching for ways to create a more dynamic and engaging way to teach marginalized students in the Philippines. Arcie and his Silid Aralan Inc. team have transformed various locally donated spaces into engaging, alternative learning environments. A once abandoned municipal building has been reconstructed into a colorful haven where students come after school to experience the fun of learning and how it applies to daily life. The room is filled with scavenged pieces of furniture, shelves made by students' parents who have construction skills and books donated from various sources. A yellow color-theme happily dominates the walls and brings life to the rooms. 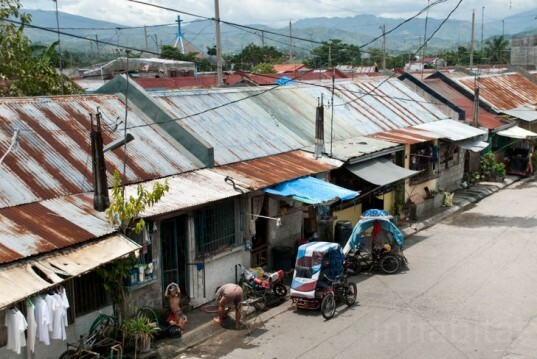 After studying at University of the Philippines, Arcie chose to live in the slums surrounding Payatas for three years. Pictured above, Payatas is a large mountain that was formed from Manila's trash in Quezon City. In 2000, an avalanche occurred killing hundreds of families, many of whose bodies remain buried in the heap. The site is officially closed but a new trash mountain, Montalban, has begun mounting right by its side. "A lot of the students we're working with in the Philippines come from families that have worked as trash scavengers at a local dump site and for them garbage is not only a part of everyday life, it can be a means to a paycheck," explains Alex. Many of the Filipino students live in housing provided by the National Housing Authority (NHA), as seen above. The NHA charges tenants 500 pesos per month (just over US$10), a sum which the tenants struggle to come up with each month. Trash collection trucks make up the majority of traffic in the region. Their exhaust mixed with the tropical humidity pollute the air, resulting in an extremely high rate of lung cancer. On average, scavengers make about US$5-6 per day from which they must use to feed their family and hope to save whatever they can for the month's rent. NHA dwellings are a luxury for many who have spend years living in makeshift conditions on the street. 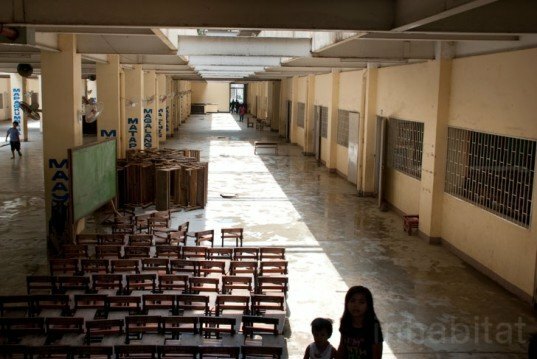 Filipino public schools tend to have few resources, a stark contrast to St. George's of Montreal. "The students are asked to portray a message through what they see from the pure visual realities of their environment, and are able to develop organic understandings of environmental realities," explains Christian. Students exchange experiences of how waste and recycling are managed within their own cultures. For instance, in the Philippines waste is regularly recycled into daily life. 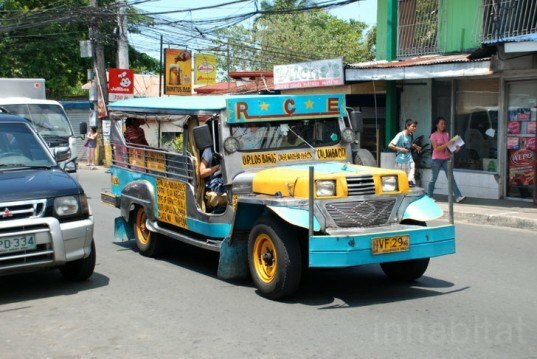 Jeepneys, the country's most popular means of public transportation, are welded together from scrap metal. Looking to the future, Alex explains, "In terms of goals, I'd like to see this spread to other schools. We aim to have Iwastology be a completely self-sufficient curriculum model, using local university students to teach the high school students, and using locally sourced volunteer labor for the student-led projects."